Wow. I heard My Absolute Darling was quite disturbing, as it portrays the mental, emotional, physical, and sexual abuse of 14-year-old Turtle by her father Martin, a survivalist. Well, yes, it is disturbing. Their relationship is central to the novel, and, as she loves him dearly and knows no other relationship norms, it is not a pleasurable relationship to explore. However, I think the plot is actually not about abuse, but about how Turtle carves an identity for herself in spite of her horrendous circumstances. She is stunningly courageous and brutally honest with herself. Tallent's voice is astounding. His writing draws you in. I had trouble putting this book down. His use of language is beautiful, especially as he displays his extensive and fascinating knowledge about Mendocino flora and fauna, where the novel is set. His apparent familiarity with guns is chilling. I had to Google "Sig Sauer." What I don’t know about guns can fill a novel this long. This is a difficult read ... if you are looking for a pleasurable beach novel, choose the last book I blogged about, The Things We Keep. 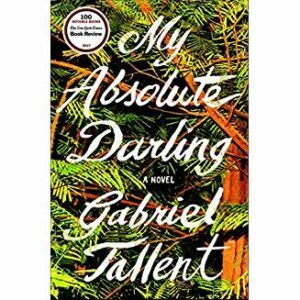 If you want a compelling read that touches your heart and soul and will stay with you, read My Absolute Darling.